Tottenham deservedly ended Pep Guardiola's perfect Premier League start and underlined their own title credentials with a thrilling victory over Manchester City at White Hart Lane. Guardiola had won his previous six games and 10 of his previous 11 matches in charge, but City were outplayed by a vibrant Spurs who moved second in the table and are now the league's only unbeaten team. Spurs dominated from the start and were in front early on when Aleksandar Kolarov sliced Danny Rose's cross into his own net after nine minutes. Dele Alli confirmed their superiority eight minutes before half-time with a cool finish from Son Heung-min's pass. 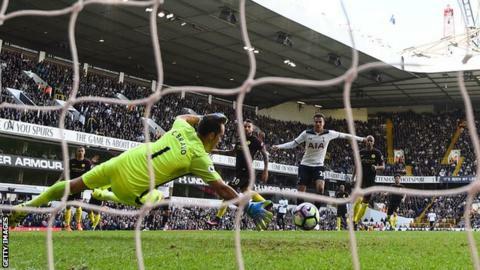 Spurs could even afford the luxury of seeing Erik Lamela's second-half penalty saved by City keeper Claudio Bravo, and even though Sergio Aguero twice brought Hugo Lloris into action, once when he turned a shot on to the post, Mauricio Pochettino's side fully deserved a convincing win. Listen: 5 live Football Daily: Have Spurs opened up the title race? If Liverpool are being touted as potential title winners after their fourth successive Premier League win at Swansea City on Saturday, then it is positively insulting to Tottenham not to elevate them to the same bracket after this pulsating performance. Spurs took charge from the first whistle against a City side many felt were shaping up to run away with the title - barely allowing Guardiola's side a second to breathe and refusing to allow them any time to impose their passing game. And it was all done without main marksman Harry Kane, who is sidelined with an ankle injury. In many respects this was the first time Spurs have fully hit their stride this season, and what a time to do it. On days like this the team that pushed Leicester long and hard for last season's Premier League title look the complete package from back to front. They have a reliable keeper in Hugo Lloris, strength in defence in the shape of Jan Vertongen and Toby Alderweireld allied to the midfield power of Victor Wanyama and Moussa Sissoko plus the creation of Christian Eriksen, Alli and Son. This was a big statement. Guardiola prides himself on the high pressing style of his side and work on the ball once they gain possession - they were beaten in all aspects of this by Spurs. One moment early in the second half summed up the way Spurs went about their business. Keeper Bravo was hurried into a clearance and when Nicolas Otamendi received the ball seconds later, he was surrounded and sliced the ball into touch to the obvious delight of Pochettino. It is City's first defeat under Guardiola, so hardly time for a mass inquest - but Spurs may have shown there is a way to unsettle his multi-talented side. The average position of Manchester City's players (right) contrasts with that of Tottenham's (left) emphasising how Pochettino's side were able press their opponents in key areas and also demonstrates that they had more width to their game. Spurs and Manchester City were both missing big players in Kane and Kevin de Bruyne respectively - and there was no doubt who coped better. Pochettino understandably maintained faith in the revitalised South Korean Son. His energy in attack, while also acting as their first line of defence, typified Spurs and suited their style more than the physical presence of £17m summer signing Vincent Janssen. City showed the odd flash from Aguero but Raheem Sterling could not exert any influence, with David Silva also marginalised. As stated before, City remain a squad of high quality but how they missed the moments of magic that Belgium midfielder De Bruyne can provide for them. "It was a great, great victory for us against this opposition. I am very happy. Sometimes when you have a plan, it is good, sometimes less so, but Manchester City are a great team. It is difficult to play against them. "We need to follow this after the international match and we have more tough games after the international break. If you play like we did today with passion and aggression then you will always have a chance. It is always about mentality. That is what helps us run and play as we want to. "The collective performance was strong. It is too early to take this into the table yet. We are still creating our philosophy." "It was a tough game, we knew that. Tottenham have been a very good team for the last three years, fighting. We were little late in all aspects. We could not have so many chances, in many aspects they were better than us. "It is October, you cannot imagine what my team has already done. I am new here. So far it has been an amazing performance but we need more, we have to work more, it is what it is. "I never thought that we would not lose a game, you can't imagine that. It is normal to the process, sometimes it happens and it can help us improve." Pep Guardiola lost his first league game as a manager since a 2-1 home defeat to Mainz in March while he was in charge of Bayern Munich. Son Heung-min has been involved in eight goals in his last seven Premier League games (six goals, two assists). Manchester City had not trailed in the Premier League this season before Aleksandar Kolarov's own goal. Spurs have missed three consecutive penalties against Manchester City, Roberto Soldado and Jermain Defoe the others to miss before Erik Lamela on Sunday. City have never won a Premier League game when they have been two or more goals down at half-time (D1 L48). Spurs have made their best ever start to a league season, collecting 17 points from their opening seven matches. After the international break, Tottenham face West Brom at The Hawthorns on Saturday 15 October (15:00 BST), while Manchester City will look for some home comforts at Etihad Stadium as they host Everton at the same time. Match ends, Tottenham Hotspur 2, Manchester City 0. Second Half ends, Tottenham Hotspur 2, Manchester City 0. Offside, Tottenham Hotspur. Victor Wanyama tries a through ball, but Vincent Janssen is caught offside. Attempt saved. Sergio Agüero (Manchester City) right footed shot from the centre of the box is saved in the centre of the goal. Assisted by Kelechi Iheanacho. Substitution, Tottenham Hotspur. Vincent Janssen replaces Son Heung-Min. Foul by Georges-Kévin Nkoudou (Tottenham Hotspur). Attempt blocked. Sergio Agüero (Manchester City) right footed shot from outside the box is blocked. Assisted by Nicolás Otamendi. Attempt blocked. Kelechi Iheanacho (Manchester City) left footed shot from the left side of the box is blocked. Assisted by Aleksandar Kolarov with a cross. Attempt saved. Sergio Agüero (Manchester City) left footed shot from the centre of the box is saved in the top left corner. Assisted by David Silva. Attempt blocked. Erik Lamela (Tottenham Hotspur) right footed shot from the centre of the box is blocked. Assisted by Son Heung-Min. Corner, Tottenham Hotspur. Conceded by Nicolás Otamendi. Attempt saved. Kelechi Iheanacho (Manchester City) left footed shot from the left side of the box is saved in the centre of the goal. Assisted by David Silva with a through ball. Offside, Manchester City. Pablo Zabaleta tries a through ball, but Sergio Agüero is caught offside. Substitution, Tottenham Hotspur. Eric Dier replaces Moussa Sissoko because of an injury. Attempt saved. Raheem Sterling (Manchester City) right footed shot from outside the box is saved in the bottom left corner. Assisted by Aleksandar Kolarov. Offside, Manchester City. Pablo Zabaleta tries a through ball, but Kelechi Iheanacho is caught offside. Substitution, Manchester City. Kelechi Iheanacho replaces Jesús Navas.